Sales volume. Overall, down 34,61%. 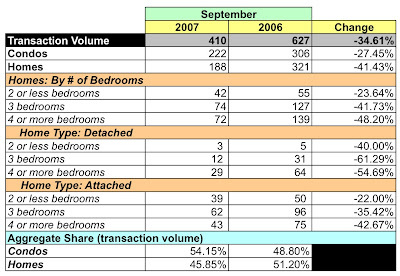 YoY, condo sales volume was down 27.45% and home sales volume dropped 41.43%. Sales volume was negative across the board, with decreases ranging from 22 - 61.29%. Condos represented 54.15% of the units sold. Dollar volume. In aggregate, down 37%%. Dollar volume for condos and homes was negative: -40.01% for condos and -35.11% for homes. Condos constitute slightly less than 37% of the dollar volume. Average sales price. Again, negative. Overall, average prices fell 3.65%. 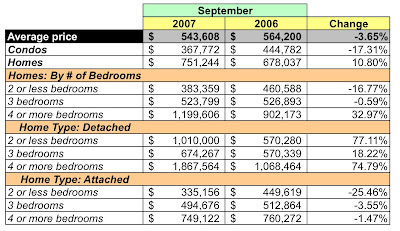 Condos fell 17.31% to $367,772 while homes increased 10.8% YoY to $751,244. Days on market. On average the DOM grew to 69 days, but a closer look shows that 60% of all homes sold within 60 days, a performance metric that's been pretty consistent these past few months. Inventory. Based on the month's transaction rates and active listings, there is a 7.32 month supply of condos, an increase of 77.06% from August, while home inventories rose 85.18% to a 9.65 month supply. Wow. I had to restrain myself from using exclamation points because these are the worst numbers I've seen in the year I've been doing this. So what to make of all of this? It's quite possible - probable? - that the data reflect the August credit and mortgage meltdown; I suppose October's data may give an indication of whether September was an anomaly or the beginning of a very bad market direction. 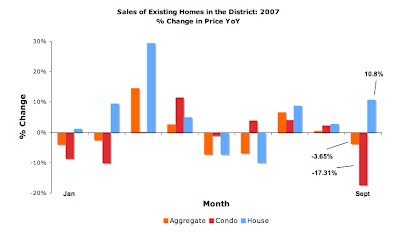 The increase in average sales prices for homes is interesting. The $1MM average price for detached homes with 2 or fewer bedrooms is an outlier - these homes tend to sell for less than $400,000. In fact, detached homes as a category were the only group that had positive growth in average sales price; the other two were at best a mixed bag. 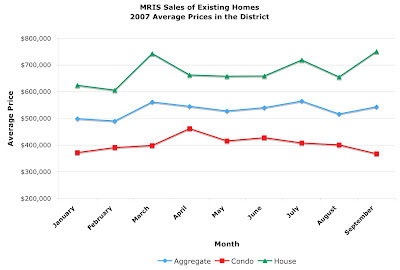 You outdo yourself with your excellent analysis of the DC market. I definitely check here to see what's going on. Still in the market for the right unit. Thanks for the kind words. I'm glad you find this useful. Yes, I agree. Appreciate the effort, it's helpful data.